Come join us for our last Sharing Creativity and Company class in 2008. Our Calendar and Quick Stocking Stuffers Class is this Saturday. Too busy to take class? 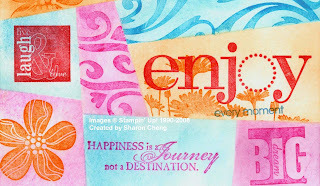 You are welcome to stop by and visit and shop our retired stamp sale. You'll pay a $5.00 registration fee and then sign up for as many of the following project kits as you would like. Please bring your favorite adhesive, paper cutter and scissors. Any other supplies that are needed are listed in the project description. 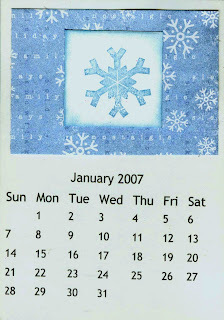 This is another style of calendar that has been popular for many years. With this version, you'll learn a variation of the retiform technique. This calendar cover is actually made with one sheet of white cardstock. Bring your own pocket/purse calendar and we'll cut the cardstock to fit your calendar at the workshop. There are several different sizes available at stores like Target, Michael's, and the Dollar store. Fee $2. Please e-mail me if you would like to register for this class. We'll have a limited supply of additional kits available at the workshop. At last year's class, we sold out of multiple kits so sign up now to reserve the ones you want.